Large Range of Awnings for Sale At Bude Windows & Conservatories Ltd. We offer quality glazing and home improvement services across Bude and the surrounding Cornwall and Devon areas. To find out more about our services contact our team today who will be happy to help you. Here at Bude Windows we pledge to give our customers only the best of the best when it comes to the products we use for creating awesome outside/inside living spaces. That’s why we work with Weinor, one of Germany’s leading awning and glass patio manufacturers, who supply their superior high-grade products to us ready for assembly to be carried out on your property. Weinor, who have been in business for more than 50 years, supply their products only to carefully chosen and vetted specialist installers, and we’re proud to say that we make the grade. The Weinor product range includes state-of-the-art patio awnings that come in a stunning range of designs, colours and fabric types, with innovative add-on features like LED lighting, heating and motorised “smart” opening and closing. Awnings can be customised to suit your requirements and the setting. Weinor awnings score top marks for durability, functionality, design and superior sun protection. The special non-rusting, corrosion-resistant drop-forged aluminium alloy that is used to fabricate the frames and arms for Weinor awnings is also used for the frames and uprights for the elegant and chic Weinor Glasoase® – a glass patio enclosure, completely glazed to provide protection from the elements while allowing light to flood in and bring the garden into your home, all year round. The frameless glass enclosing panels can be customised to fit any space, and designed to slide open effortlessly giving unobstructed access to the outdoors in fine weather. Weinor ‘Terazza’ glazed verandas or patio roofs, also with powder-coated aluminium frames that are available in 200 RAL colours, are equally as elegant and functional – a popular choice for discerning homeowners who want to make the most of a terrace or balcony, and increasingly sought after by architects and designers. The Weinor Terazza patio roof has slim lines and a “screwless” look, with concealed fixings and integrated guttering and downspout invisible from the outside, its dainty appearance belying its actual incredible strength, durability, sturdiness and weather resilience. The glazing used is toughened, high quality laminated safety glass that can carry a heavy snow load. Weinor’s structures are designed to suit any style of house, and the vast range of frame and awning fabric colours available mean that you can pick a shade to harmonise with the architecture and reflect your personal taste. There is no doubt that as a home-owner you will not fail to be as excited as the team at Bude Windows are about the range of possibilities the finely engineered German Weinor products offer for expanding your living space into the outdoors, by combining various elements of the award-winning Weinor range to suit your home, lifestyle and budget. We will be happy to show you how we can add luxury and comfort to your home with Weinor’s timelessly classic, premium quality additions and extensions, each delivered with a certificate of authenticity. 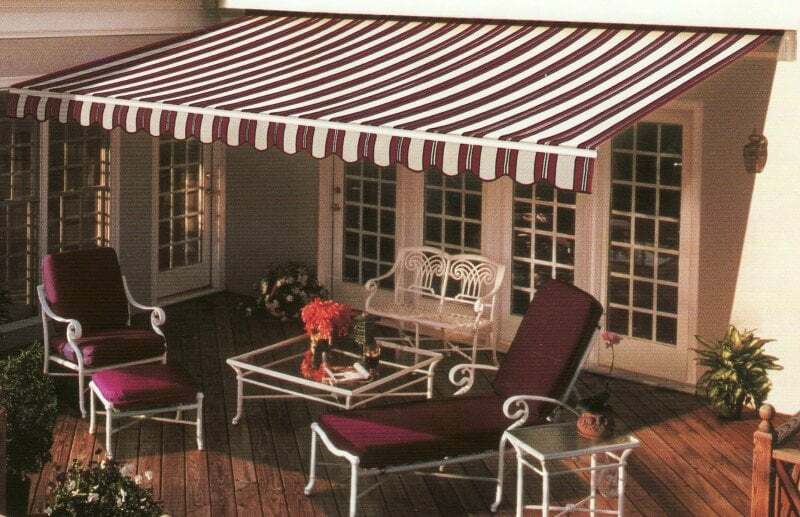 For a free estimate on awning installations, contact us today. We can install quality awnings across Bude, Camelford, Okehampton, Holsworthy, Devon and the surrounding Devon and Cornwall areas.